Eyelashes inspired by the 3-D film "Cirque du Soleil: Worlds Away"
Click on the lashes to view a larger image. Fashion lashes look so real, so natural that others think you were born with beautiful lush eyelashes. Made of 100% sterilized human hair, each lash strip is knotted and feathered by hand to achieve the highest quality. Reusable, easy to apply (use Ardell LashGrip Adhesive sold separately) and comfortable to wear. Stay secure until you take them off. Each package contains 1 pair of lashes. InvisiBands lashes have an invisible band that connects the hair strands to form a strip. They are knotted and feathered by hand for perfect uniformity and an absolutely natural look. Made of 100% sterilized European human hair. Reusable, easy to apply (use Ardell LashGrip Adhesive sold separately) and comfortable to wear. Each package contains 1 pair of lashes. Just for Fun Wildlashes are just what you need to create your individuality and glamorous looking lashes with a hint of glitter. Fun, natural looking styles with the added sparkle of elegance. Made of 100% sterilized human hair. 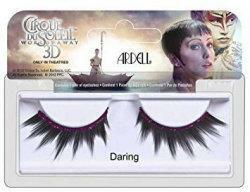 Reusable, easy to apply (use Ardell LashGrip Adhesive sold separately) and comfortable to wear. Each package contains 1 pair of lashes. Runway lashes are ideal for make-up artist to create beautiful, glamorous runway looks. Made of 100% sterilized human hair. 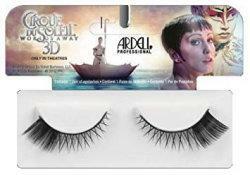 Reusable, easy to apply (use Ardell LashGrip Adhesive sold separately) and comfortable to wear. Each package contains 1 pair of lashes. DuraLash individual lashes are the closest thing to natural lashes ever developed. These exclusive knot-free individual lashes are permanently curled, waterproof, easy to apply, and comfortable to wear. They are so natural you forget they are not your own, and they can be worn for up to 6 weeks at a time. Ardell LashTite Adhesive, sold separately, is designed for use with DuraLash individual lashes. Each package contains 56 individual lashes.